Texting while driving, also called texting and driving, is the act of composing, sending, reading text messages, email, or making similar use of the web on a mobile phone while operating a motor vehicle. Texting while driving is considered extremely dangerous by many people, including authorities, and in some places have either been outlawed or restricted. A survey of more than 90 teens from more than 26 high schools throughout the United States conducted by Liberty Mutual Insurance Group in 2006 showed that 46% of students consider texting to be either "very" or "extremely" distracting. An American Automobile Association study showed that 34% of teens (age 16–17) admitted to being distracted behind the wheel because of texting and 40% of American teens say they have been in a car when the driver used a cell phone in a way that put people in danger. A study involving commercial vehicle operators conducted in September 2009 concluded that though incidence of texting within their dataset was low, texting while driving increased the risk of accident significantly. Texting has become a social norm since the early 2000s because of the popularity of smartphones. There have been many studies that have linked texting while driving to be the cause of life-threatening crashes due to driver distraction. The International Telecommunication Union states that "texting, making calls, and other interaction with in-vehicle information and communication systems while driving is a serious source of driver distraction and increases the risk of traffic accidents". In 2013 the National Safety Council estimated there were about 1.4 million crashes in the US involving cell phone use. Their model predicted text messaging was involved in 6-16% of all car accidents in the US. In 2010, texting while driving amongst young drivers was named a disease burden and ranked 8th overall in the global years of life lost (YLL). The premature mortality of young drivers who crash as a result of distracted driving has a greater effect on YLL than most diseases do. A 2010 experiment with Car and Driver magazine editor Eddie Alterman, which took place at a deserted air strip, showed that texting while driving had a worse impact on safety than driving while intoxicated. The Institute of Industrial Engineers concluded that drivers are 20 times more likely to be involved in an crash while texting and driving as opposed to driving while intoxicated. While legally drunk, Alterman's stopping distance from 70 mph (110 km/h) increased by 4 feet (1.2 m); by contrast, reading an e-mail added 36 feet (11 m), and sending a text added 70 feet (21 m). While celebrities such as Oprah Winfrey have campaigned against texting while driving, there are reports that the message has not been getting through. The scientific literature on the dangers of driving while sending a text message from a mobile phone, or driving while texting, is limited but growing. A systematic review study at the Queensland University of Technology Centre for Accident Research and Road Safety-Queensland CARRS-Q found that visual-manual interactions such as texting and browsing have a detrimental effect on a number of safety-critical driving measures. Specifically, negative effects were seen in detecting and responding correctly to road signs, detecting hazards, time spent with eyes off the road, and (only for sending text messages) lateral position. Mean speed, speed variability, lateral position when receiving text messages, and following distance showed no difference. A separate, yet unreleased simulation study at the University of Utah found a sixfold increase in distraction-related crashes when texting. On Sept. 29, 2010, the insurance industry's Highway Loss Data Institute released research purporting to show that texting-while-driving bans in four states failed to reduce crashes and may instead have contributed to an increase in road crashes. U.S. Transportation Secretary Ray LaHood called the study "completely misleading". In March 2012 the UK's Institute of Advanced Motorists published a study which claimed that using smartphones for social networking while driving is more dangerous than drink-driving or being high on cannabis. In 2013, based on the 2011 Youth Risk Behavior Surveillance System Survey conducted by the Center for Disease Control in the US, nearly half of all male and female respondents aged 16 to 19 reported they texted while driving. Research by the Transport Research Laboratory showed that texting while driving slowed a driver's reaction time more so than drinking alcohol or using drugs. Driver's reaction times decreased by 46% while making a call, 37% when texting and driving, and 27% during hands-free calls. Those who were drinking and driving at the limit of 80 mg of alcohol per 100ml of blood, reaction times slowed by 13% and 21% for those under the influence of cannabis. A study by the University of Buffalo revealed that a similar habit, texting while walking, causes more injuries than texting while driving. In October 2016, Texas A&M Transportation Institute and Aceable Driving published a study showing that teenagers are more likely to witness their parents or legal guardians driving distracted than their friends and peers. The study also suggested that texting and driving bans are somewhat effective. In Austin, Texas, where a hands-free-driving ordinance prohibiting the use of electronic hand-held devices while operating a vehicle or bicycle has been in place since 2015, 41% of teens reported that they never witnessed their parents or guardians driving distracted. In Houston, Texas, which had no ban on hand-held devices during the time of the study, only 23% of teens said the same. On July 27, 2009, the Virginia Tech Transportation Institute released preliminary findings of their study of driver distraction in commercial vehicles. Several naturalistic driving studies, of long-haul trucks as well as lighter vehicles driving six million combined miles, used video cameras to observe the drivers and road. Researchers observed 4,452 "safety-critical" events, which includes crashes, near crashes, safety-critical events, and lane deviations. 81% of the "safety-critical" events involved some type of driver distraction. Text messaging had the greatest relative risk, with drivers of heavy vehicles or trucks being more than 23 times more likely to experience a safety-critical event when texting. The study found that drivers typically take their eyes off the forward roadway for an average of four out of six seconds when texting, and an average of 4.6 out of the six seconds surrounding safety-critical events. The study revealed that when traveling at 55 miles per hour (89 km/h), a driver texting for 6 seconds is looking at the phone for 4.6 seconds of that time and travels the distance of a football field without their eyes on the road. Some of VTTI's conclusions from this study included that "texting should be banned in moving vehicles for all drivers", and that "all cell phone use should be banned for newly licensed teen drivers". The results of the study are listed in the table below. (c) cognitive distraction associated with listening to or talking on a handheld or hands-free device is associated with real world crashes and near-miss events to a lesser extent than is commonly believed, and such distractions may even enhance safety in some instances. The popularity of mobile devices has some unintended and even dangerous consequences. The use of mobile devices is linked to a significant increase in distracted driving, resulting in injury and even loss of life. In 2010 the National Highway Traffic Safety Administration reported that distracted drivers were the cause of 18% of all fatal crashes with 3,092 people being killed, and crashes that resulted in injuries with 416,000 people wounded. According to a Pew Research Centre survey, 40% of American teens say that they have been in a car where the driver used a cell phone in a way which put people in danger. The Virginia Tech Transportation Institute has found that text messaging creates a crash risk that is 23 times worse than driving while not being distracted. Eleven percent of drivers who are between the ages of 18 to 20 who were involved in an automobile crash and survived have admitted that they were either sending or receiving texts when they crashed. A number of countries ban all cell phone use while driving (talking and texting). The laws are much the same for all states and territories in Australia. The driver of a vehicle (except an emergency vehicle, taxi or police vehicle) must not use a mobile phone while the vehicle is moving, or is stationary but not parked, unless the driver is exempt from this rule under another law of this jurisdiction. The law does not apply if the phone is in a secured fixed mounting that is positioned in such a way that the driver does not have to take their eyes off the road. The law also does not apply if the driver is using a hands free device. In some locations, provisional or learner drivers are banned from all forms of mobile phone usage while they are in control of a vehicle. Apart from mobile phones, drivers should not appear to be distracted by anything else; this includes GPS devices and PDAs. All provinces and the Northwest Territories have banned both talking on hand-held phones and texting while driving. The country's other two territories, Nunavut, and Yukon, have yet to enact bans. Any use of a mobile phone is forbidden as long as the vehicle's engine is running. This does however not apply to hand-free devices, provided that the driver does not become distracted. In 2014 a higher court overturned a ruling of a lower court and ruled that the use of a mobile phone is allowed while in traffic, if it occurs while the vehicle is stopped and a start-stop system has turned the engine off. Any use of a mobile phone is forbidden if the vehicle is moving. This does not apply, however, to hands-free devices. In 2009, the New Zealand Government introduced new clauses to its Land Transport (Road User) Rule, which ban any use of mobile phones while driving, except for emergency calling to 111 or *555 (only if unsafe or impracticable to stop the vehicle to make the call). The Government of Sweden, as of 22 December 2012, has stated that texting while driving is not an offence that can lead to a ban, but that it is looking to clarify the Highway Code to include it under reckless driving. In 2013, Sweden outlawed mobile telephone activities if it affects driving in a negative way. The use of mobiles while driving is prohibited and offenders can also expect to have demerit points added to their record. In one instance a UAE minister was himself given a fine for using his mobile phone while driving. Any use of a hand-held mobile phone or similar device while driving, or supervising a learner driver, is illegal. This includes when stopped at traffic lights. The only exceptions are emergency calls to 999 or 112. Texting while driving is generally outlawed for drivers in all states and the District of Columbia except Arizona, Montana, and Missouri. On October 1, 2009, the U.S. Department of Transportation (DOT) announced President Barack Obama's signing of an Executive Order directing federal employees not to engage in text messaging while driving government-owned vehicles, among other activities. According to Transportation Secretary Ray Lahood, “This order sends a very clear signal to the American public that distracted driving is dangerous and unacceptable. It shows that the federal government is leading by example." As a part of a larger move to combat distracted driving, the DOT and National Highway Traffic Safety Administration (NHTSA) launched the public information website distraction.gov. In addition, a petition has been created on the White House petitions site, We the People, to ask the Obama administration to encourage all states that have not done so to create laws that ban texting and driving. On January 26, 2010, the U.S. Department of Transportation announced a federal ban on texting while driving by truckers and bus drivers. Prohibits writing, sending, or reading any text-based communication, including via internet; also prohibits drivers under 18 with provisional licenses from talking on cell phones while driving. Prohibits holding or supporting, with any part of the body, a wireless telecommunications device or stand-alone electronic device. Reading, writing, and sending email or text messages by all drivers when the vehicle is in motion. All cell phone usage by drivers under 18, regardless of license type. Exceptions for emergencies, and for GPS use that does not involve data entry. For drivers under 18 on restricted licenses, mandatory 180-day waiting period from the time of offense before graduating to the next license level. This applies from the law's effective date. North Carolina December 1, 2009 Text messaging as well email and internet use is prohibited for all drivers. Drivers under the age of 18 who have a provisional are prohibited from using cell phones while driving, unless they are calling their parents. Operators of school buses are prohibited from using cell phones while driving. Texting, email and internet use: $100 and no points against license. Drivers under 18 using cellphone: $25. School bus operators using cell phones $100, no points. Primary offense for drivers under 18 years old. Youth drivers may be stopped and cited for texting while driving. Secondary offense for adult drivers. Adult drivers must be stopped for another offense before they can be cited. Oregon January 2010 House Bill 2377 prohibits all drivers from using a mobile communication device while operating a motor vehicle. A mobile communication device is defined as "a text messaging device or a wireless, two-way communication device designed to receive and transmit voice or text communication." House Bill 2872 prohibits drivers that are under 18 years of age from using any type of mobile communication device such as a cell-phone. This includes text-messaging and does not allow for hands-free operation of a cell-phone. This law applies if one is under 18 and driving with a provisional driver's license, a special student driver permit, or an instruction driver permit. First offense: $100 fine + surcharge + 15% = $156 and 2 points on license. Junior Operators (under 18) subject to 30-day suspension. Second offense (within two years of first): $250 fine + surcharge + 15% = $329, 5 points on license. Junior operators subject to 30-day suspension. The law is primary, meaning police officers can stop motorists suspected of this offense alone. On August 29, 2007, Danny Oates was killed by a young driver of a car, allegedly texting while driving. The defense had argued that driver Jeffrey Woods had possibly suffered a seizure during the time of the accident. On January 3, 2008 Heather Leigh Hurd was killed by a truck driver who allegedly was texting while driving. Her father Russell Hurd has been actively supporting a law in various U.S. states called Heather's Law that would prohibit texting while driving. The 2008 Chatsworth train collision, which killed 25 people, and which occurred on September 12, 2008, was blamed on the operator sending text messages while operating the train. In May 2009 a crash occurred on the MBTA Green Line in the Boston area of the MBTA, when a driver, 24-year-old Aiden Quinn, was text messaging his girlfriend while driving the train. The crash, which injured 46 people, was estimated by MBTA officials to have cost $9.6 million. Beverly Hills plastic surgeon Frank Ryan's fatal crash on August 16, 2010 may have been the result of distracted driving due to texting. In June 2012 18-year-old Aaron Deveau of Haverhill, Massachusetts was found guilty of motor vehicle homicide by texting. He was sentenced to two years in prison and loss of his license for 15 years. Deveau was the first person in the state of Massachusetts to be convicted of motor vehicle homicide by texting, and possibly the first in the United States. In September 2012, 21-year-old Stephanie Kanoff of Sun Prairie, WI was found guilty by a jury in July of homicide by negligent driving for the Oct. 24, 2010 death of Dylan Ellefson, 21, a senior at UW-Madison, who was behind his disabled car when he and his car were struck by Kanoff's minivan. Kanoff was also sentenced to serve two years of extended supervision after her release from prison. In addition to prison and extended supervision, Kanoff was ordered to spend 100 hours speaking to young people learning to drive and other groups about the dangers of texting while driving, and was also ordered to not drive with a phone that's turned on in the driver's area of a car. Kanoff will also have to take a driving safety course to get her license back after a mandatory yearlong revocation. In March 2017, near Garner State Park, which is located in Concan, Texas, 13 people in a church bus were killed when a texting pickup truck driver crossed the center line and slammed into their bus. In 2009, it was reported that some companies, including iZUP, ZoomSafer, Aegis Mobility, and cellcontrol by obdEdge employ systems that place restrictions on cell phone usage based on the phone's GPS signal, data from the car itself or from nearby cellphone towers. Also, companies like TextNoMore offer an opt-in solution that rewards users for activating. The use of telematics to detect drunk driving and texting while driving has been proposed. A US patent application combining this technology with a usage based insurance product was open for public comment on peer to patent. The insurance product would not ban texting while driving, but would charge drivers who text and drive a higher premium. In 2013, the use of location-based technology to detect potential texting while driving situations has been announced. This approach utilizes the GPS and Network Location services of Android mobile phones to estimate the speed that the cell phone is travelling at the time text messages are sent. The recommended approach in this case is for parents install an app on their children's Android mobile phone to silently monitor texting, send alerts when potential texting while driving situations occur, and counsel phone holders (in this case, teenage drivers) after the fact. To date there isn't a technology based solution for iPhones. This is due to the application security sandbox approach Apple has implemented on the iOS operating system. An iPhone app does not have access to low level device interfaces, as a result an iPhone app cannot block or auto respond to a text message while a person is driving. However the SafeTexting Campaign has developed an iPhone app that detects if a person is driving and reminds them not to text and drive. Over the past few months, various state police forces in Australia have started trialling cameras which have the ability to pick up errant drivers from more than 500 metres away. Police in Western Australia makes use of undercover motorcycles to keep an eye on other motorists and any offence will be recorded on the motorcycle officer's helmet camera. Police in India have become more aggressive on a wide variety of traffic violations and once again, there is a widespread use of cameras. ^ a b "Teens and Distracted Driving". Pew Research Center. Retrieved 2012-01-25. ^ "Driver Distraction in Commercial Vehicle Operations" (PDF). U.S. Department of Transportation. Retrieved 2012-02-14. ^ "Annual Estimate of Cell Phone Crashes" (PDF). ^ "A Meta-Analysis of the Effects of Texting on Driving. Accident Analysis and Prevention". ^ Texting And Driving Worse Than Drinking and Driving, CNBC, June 25, 2009. ^ Oviedo-Trespalacios, Oscar; Haque, Md. Mazharul; King, Mark; Washington, Simon (November 2016). "Understanding the impacts of mobile phone distraction on driving performance: A systematic review". Transportation Research Part C: Emerging Technologies. 72: 360–380. doi:10.1016/j.trc.2016.10.006. ^ Hosking, Simon; Kristie Young; Michael Regan. The Effects of Text Messaging on Young Novice Driver Performance (PDF). ^ "Text messaging not illegal but data clear on its peril". Retrieved 30 September 2014. ^ Mark Wilson. "89% of Americans Want Texting While Driving Outlawed". Gizmodo. Retrieved 30 September 2014. ^ Valencia, Milton (8 May 2009). "MBTA: Conductor in Boston trolley crash was texting his girlfriend". The Boston Globe. ^ Austin, Michael (June 2009). "Texting While Driving: How Dangerous is it?". Car and Driver. Retrieved July 3, 2010. ^ "Texting And Driving Worse Than Drinking and Driving at cnbc.com". CNBC. Archived from the original on 6 October 2014. Retrieved 30 September 2014. ^ Paul McNamara (28 September 2010). "Texting while driving bans don't work, may actually hurt, study finds". Network World. Archived from the original on 30 March 2014. Retrieved 30 September 2014. ^ ""Warning about mobile phone driving danger" at which.co.uk". Retrieved 30 September 2014. ^ O’Malley Olsen, Emoly; et al. (June 2013). "Texting While Driving and Other Risky Motor Vehicle Behaviors Among US High School Students". Pediatrics. 131 (6). Retrieved 18 June 2013. ^ Arbuthnott, George; Ward, Audrey (8 June 2014). "Texts worse than drink-driving". The Sunday Times. Retrieved 8 June 2014. ^ "Using a mobile while driving 'worse than drink or drugs'". itv. 8 June 2014. Retrieved 8 June 2014. ^ "This Habit Causes More Injuries than Texting and Driving... And You're Probably Doing It". Catania and Catania. 10 June 2014. Retrieved 16 August 2014. ^ "Tales Out of School". Center for Transportation Safety. 2016-10-14. Retrieved 2018-02-01. ^ "Hands-Free Austin | Police | AustinTexas.gov - The Official Website of the City of Austin". www.austintexas.gov. Retrieved 2018-02-01. ^ "Teens Learn Distracted Driving Habits From Parents [STUDY]". Aceable. Retrieved 2018-02-01. ^ "Texting While Driving Greatly Increases Crash Risks". Retrieved 16 August 2014. ^ Clayton Hasbrook (May 28, 2014). "Survey: More Than Fourth of Drivers Text While Driving". Retrieved 16 August 2014. ^ "April is Distracted Driving Awareness Month - Virginia Tech Transportation Institute - Virginia Tech". 15 April 2013. Archived from the original on 13 September 2014. Retrieved 30 September 2014. ^ "The Dangers of Texting While Driving". Federal Communications Commission. Federal Communications Commission. Retrieved 23 June 2014. ^ "Yahoo News - Latest News & Headlines". Retrieved 26 May 2016. ^ "Telefonieren vor roter Ampel: Gericht erlaubt Handy am Ohr - bei Autos mit Start-Stopp-Funktion" [Calling at the red light: Court allows cell at the ear - in cars with a start-stop system] (in German). Der Spiegel. 28 October 2014. Retrieved 4 February 2015. ^ "Mag ik bellen in de auto?" [Can I use my phone in a car?] (in Dutch). Dutch Government. Retrieved 13 August 2016. ^ "Land Transport (Road User) Rule 2004 (SR 2004/427) (as at 01 January 2014) 7.3A Ban on use of mobile phones while driving". New Zealand Legislation. 1 January 2014 . Retrieved 23 September 2014. ^ "Driving rules and legislation". New Zealand Police. 23 September 2014. Retrieved 23 September 2014. ^ "nget förbud mot sms under bilkörning" (in Swedish). .svt.se. 22 December 2012. Retrieved 26 August 2013. ^ Fredrik Rundkvist (3 June 2016). "De här möter du – varje dag" (in Swedish). Aftonbladet. Retrieved 19 March 2017. ^ "Sheikh Abdullah thanks police after texting while driving stop". Retrieved 26 May 2016. ^ "Using mobile phones when driving: the law". Retrieved 26 May 2016. ^ andrew.currin.ctr@dot.gov (8 September 2016). "U Drive. U Text. U Pay". NHTSA. ^ "Distracted Driving". Retrieved 26 May 2016. ^ "We the People: Your Voice in Our Government". Archived from the original on 2014-06-16. ^ "Government Bans Texting By Truck And Bus Drivers". Archived from the original on 27 January 2010. ^ Alabama Department of Public Safety. "Act No.2012.291" (PDF). Alabama Department of Public Safety. Retrieved 2013-05-24. ^ "Alaska Cell Phone & Texting and Driving Laws". drivinglaws.org. Retrieved 26 May 2016. ^ "Arizona: Cell phone laws, legislation". Hands Free Info. Hands Free Info. Retrieved 16 June 2014. ^ "Arizona Cell Phone Laws". DrivingLaws.org. DrivingLaws.org. Retrieved 16 June 2014. 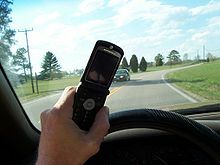 ^ "Arkansas Cell Phone & Texting and Driving Laws". drivinglaws.org. Retrieved 26 May 2016. ^ Yi, Matthew (September 25, 2008). "California bans text messaging while driving". The San Francisco Chronicle. ^ "V C Section 23123 Hand Held Wireless Telephone Prohibited Use". California Department of Motor Vehicles. California Department of Motor Vehicles. Retrieved 15 June 2014. ^ Ingold, John (June 2, 2009). "Colorado criminalizes texting, tweeting while driving". Denver Post. Archived from the original on June 11, 2009. ^ "Connecticut General Statutes, Chapter 248, Section 14-296aa". Archived from the original on 26 February 2011. Retrieved 30 September 2014. ^ "State Distracted Driving Driving Laws". Retrieved 26 May 2016. ^ "Washington DC Cell Phone, Text Messaging, & Hands Free Laws". DrivingLaws.org. DrivingLaws.org. Retrieved 16 June 2014. ^ "Texting while driving ban passes, goes to Gov. Rick Scott". CFN 13. Retrieved 2 May 2013. ^ "Florida Cell Phone & Texting and Driving Laws". DrivingLaws.org. Retrieved 20 June 2014. ^ "News: Georgia politics, Atlanta elections, Georgia Legislature". Retrieved 26 May 2016. ^ "Georgia Text Messaging and Cell Phone Laws". DrivingLaws.org. DrivingLaws.org. Retrieved 19 June 2014. ^ "Hands Free Georgia Law (HB673)". Retrieved 13 June 2018. ^ "Texting and driving ban now offically [sic] law in Idaho | News - Home". Localnews8.com. 2013-05-20. Archived from the original on 2013-11-12. Retrieved 2013-05-24. ^ "Idaho Statutes: Title 49: Motor Vehicles, Chapter 14: Traffic-Enforcement and General Provisions, 49-1401A - Texting While Driving". State of Idaho Legislature. State of Idaho Legislature. Retrieved 19 June 2014. ^ "Illinois Text Messaging and Cell Phone Laws". DrivingLaws.org. DrivingLaws.org. Retrieved 19 June 2014. ^ Howlett, Rick (May 2, 2011). "Indiana texting ban to take effect later this year". WFPL. Archived from the original on May 7, 2011. Retrieved July 15, 2011. ^ "Iowa: Cell phone laws, legislation". handsfreeinfo.com. 10 December 2008. Retrieved 19 June 2014. ^ "Kansas Text Messaging and Cell Phone Laws". DrivingLaws.org. DrivingLaws.org. Retrieved 19 June 2014. ^ "Louisiana Traffic Safety Laws". Louisiana Highway Safety Commission. Louisiana Highway Safety Commission. Archived from the original on 15 August 2014. Retrieved 19 June 2014. ^ "Maine Text Messaging and Cell Phone Laws". DrivingLaws.org. DrivingLaws.org. Retrieved 19 June 2014. ^ Wagner, John (March 18, 2009). "Md. Senate Passes Ban on Texting While Driving". The Washington Post. Retrieved May 25, 2010. ^ "BILL INFO-2009 Regular Session-SB 98". Retrieved 26 May 2016. ^ "Massachusetts bans texting while driving and GPS on phones - Mobile - Geek.com". @geekdotcom. Retrieved 26 May 2016. ^ "Massachusetts Bans Texting While Driving". Retrieved 26 May 2016. ^ "Safe driving law applies to more than just texting behind wheel". Boston.com. Retrieved 26 May 2016. ^ "Michigan texting while driving ban will be signed into law by Gov. Jennifer Granholm on Friday's 'Oprah Winfrey Show'". MLive.com. Retrieved 26 May 2016. ^ "Minnesota Text Messaging and Cell Phone Laws". drivinglaws.org. Retrieved 26 May 2016. ^ "Pawlenty signs ban on texting while driving, plus teen driver restrictions - Minneapolis and St. Paul - kare11.com". Archived from the original on 2013-01-27. ^ "Mississippi Text Messaging and Cell Phone Laws". DrivingLaws.org. DrivingLaws.org. Retrieved 19 June 2014. ^ "Mississippi: Cell phone laws, legislation". HandsFreeInfo.com. HandsFreeInfo.com. Retrieved 20 June 2014. ^ "Missouri Revised Statutes, Chapter 304, Traffic Regulations". Missouri General Assembly. Retrieved 2017-04-01. ^ "Montana: Cell phone laws, legislation". HandsFreeInfo.com. HandsFreeInfo.com. Retrieved 20 June 2014. ^ "Nebraska: Cell phone laws, legislation". HandsFreeInfo.com. HandsFreeInfo.com. Retrieved 20 June 2014. ^ "Nevada: Cell phone laws, legislation". HandsFreeInfo.com. HandsFreeInfo.com. Retrieved 20 June 2014. ^ "Nevada Text Messaging and Cell Phone Laws". DrivingLaws.org. DrivingLaws.org. Archived from the original on 18 July 2014. Retrieved 20 June 2014. ^ "New Hampshire Text Messaging and Cell Phone Laws". DrivingLaws.org. DrivingLaws.org. Retrieved 20 June 2014. ^ "New New Hampshire: Cell phone laws, legislation". HandsFreeInfo.com. HandsFreeInfo.com. Retrieved 20 June 2014. ^ "New Jersey Text Messaging and Cell Phone Laws". DrivingLaws.org. DrivingLaws.org. Retrieved 20 June 2014. ^ "New Jersey: Cell phone laws, legislation". HandsFreeInfo.com. HandsFreeInfo.com. Retrieved 20 June 2014. ^ "New Mexico Text Messaging and Cell Phone Laws". DrivingLaws.org. DrivingLaws.org. Retrieved 20 June 2014. ^ "New Mexico: Cell phone laws, legislation". HandsFreeInfo.com. HandsFreeInfo.com. Retrieved 21 June 2014. ^ "NYS DMV - Cell Phone and Texting Laws". Dmv.ny.gov. 2011-10-05. Retrieved 2013-05-24. ^ "Vehicle & Traffic Law - Distracted Driving, Talking & Texting". Safeny.ny.gov. 2011-07-12. Retrieved 2013-05-24. ^ "The Pendulum - Elon University's News Organization". The Pendulum. Retrieved 26 May 2016. ^ webmaster. "NCDOT: Error 404" (PDF). www.ncdot.gov. ^ "North Carolina: Cell phone laws, legislation". HandsFreeInfo.com. HandsFreeInfo.com. Retrieved 21 June 2014. ^ ""North Dakota Cell Phone and Texting Laws" at drivinglaws.org". DrivingLaws.org. Retrieved 30 September 2014. ^ "North Dakota: Cell phone laws, legislation". HandsFreeInfo.com. HandsFreeInfo.com. Retrieved 21 June 2014. ^ "The Facts About Texting and Driving". Dyer, Garofalo, Mann & Schultz L.P.A. Retrieved 29 May 2015. ^ "Kasich Signs Statewide Texting Ban for Drivers". WBNS-10TV Columbus, Ohio. Retrieved 30 September 2014. ^ "Oklahoma Text Messaging and Cell Phone Laws". DrivingLaws.org. DrivingLaws.org. Retrieved 20 June 2014. ^ "Oklahoma: Cell phone laws, legislation". HandsFreeInfo.com. HandsFreeInfo.com. Retrieved 21 June 2014. ^ "Oklahoma Legislative Bill 2276" (PDF). Oklahoma Legislator Website. Oklahoma Legislator. Retrieved 20 June 2014. ^ "Relating to use of mobile communication device while driving; amending ORS 811.507". Archived from the original on 2010-04-16. ^ "Pennsylvania's Texting Law Goes Into Effect, Supersedes Philadelphia's Cell Laws « CBS Philly". Philadelphia.cbslocal.com. 2012-03-08. Retrieved 2013-05-24. ^ "Pennsylvania: Cell phone laws, legislation". HandsFreeInfo.com. HandsFreeInfo.com. Retrieved 21 June 2014. ^ "Rhode Island: Cell phone laws, legislation". HandsFreeInfo.com. HandsFreeInfo.com. Retrieved 21 June 2014. ^ "Rhode Island Text Messaging and Cell Phone Laws". DrivingLaws.org. DrivingLaws.org. Retrieved 20 June 2014. ^ "S 459". Retrieved 30 September 2014. ^ Seanna, Adcox (13 June 2014). "Texting while driving now illegal statewide in SC". The Sun News. Archived from the original on 19 June 2014. Retrieved 13 June 2014. ^ "South Carolina passes statewide texting ban". carolinalive.com. WPDE. Retrieved 13 June 2014. ^ "Gov. Haley signs texting ban". wbtw.com. WBTW. Retrieved 13 June 2014. ^ "SC becomes 49th state to outlaw texting while driving". wmbfnews.com. WMBF-TV. Retrieved 13 June 2014. ^ "Texting while driving now illegal statewide in SC". wmbfnews.com. WMBF-TV. Archived from the original on 15 June 2014. Retrieved 13 June 2014. ^ Griffin, Courtney. "Texting while driving ban also includes Facebook, Twitter & Emails". WPDE. Retrieved 1 July 2014. ^ "South Dakota Distracted Driving Laws". CarInsurancePedia. Retrieved 2014-02-06. ^ "South Dakota: Cell phone laws, legislation". HandsFreeInfo.com. HandsFreeInfo.com. Retrieved 21 June 2014. ^ Anna M. Tinsley atinsley@star-telegram.com. “Texting While Driving? If You Are in Texas, You're Now Breaking the Law.” Star-Telegram, www.star-telegram.com/news/politics-government/state-politics/article170457212.html. ^ "Utah Code". Archived from the original on 2010-06-12. ^ "Utah Text Messaging and Cell Phone Laws". DrivingLaws.org. DrivingLaws.org. Retrieved 20 June 2014. ^ "Virginia Text Messaging and Cell Phone Laws". DrivingLaws.org. DrivingLaws.org. Retrieved 20 June 2014. ^ "Virginia: Cell phone, texting laws, legislation". HandsFreeInfo.com. HandsFreeInfo.com. Retrieved 21 June 2014. ^ "Washington state: Cell phone laws, legislation". HandsFreeInfo.com. HandsFreeInfo.com. Retrieved 21 June 2014. ^ "RCW 46.61.668: Sending, reading, or writing a text message while driving". Washington State Legislature. Washington State Legislature. Retrieved 21 June 2014. ^ "West Virginia: Cell phone laws, legislation". HandsFreeInfo.com. HandsFreeInfo.com. Retrieved 21 June 2014. ^ "Wyoming: Cell phone & texting laws, bills". HandsFreeInfo.com. HandsFreeInfo.com. Retrieved 21 June 2014. ^ "Man who killed bicyclist gets 6 years". The Orange County Register. Retrieved 30 September 2014. ^ "Feds probe texting before train crash - US news - Life - NBC News". msnbc.com. Retrieved 26 May 2016. ^ "Trolley Driver Was Texting Girlfriend At Time Of Crash: 46 Injured In Green Line Crash" Archived 2012-02-22 at the Wayback Machine, WCVB, Boston, May 8, 2009. ^ "Coca-Cola Hit with a $21 Million Distracted Driving Judgment". The National Law Review. Risk and Insurance Management Society. 2012-05-20. Retrieved 2012-06-05. ^ "The Truth & Consequences of Distracted Driving". Texting and Driving. Best of Bikers. 2012-08-20. Retrieved 2012-08-25. ^ "Sun Prairie woman sentenced to 1 year in prison for fatal texting crash : Wsj". Host.madison.com. 2012-09-22. Retrieved 2013-05-24. ^ "Harold Davis "'Black Box' idea travels to cars", The News-Times, 5/22/09" (PDF). ^ "US patent application 20090063201 "SoberTeen driving insurance"". Archived from the original on 2010-06-18. ^ "TxtWatcher Alerts Parents About Kids Texting While Driving | | TxtWatcherTxtWatcher". Txtwatcher.com. 2013-03-13. Retrieved 2013-05-24. ^ "SA Police to look at using high-tech traffic cameras to nab drivers who illegally use mobile phones". Retrieved 30 September 2014. ^ "WA police bust 1379 texting drivers". Retrieved 30 September 2014. ^ "Mangalorean.com - Mangalore News Articles, Classifieds to Around the World".